This Margarita Pizza Recipe Is Perfect For Dinner Tonight! As the end of his pregnancy draws near, I find myself lacking the energy I once had to cook dinner (shocking I know!). This margarita pizza is so easy and so delicious it is begging to be made for the whole family – the perfect thing to make for dinner tonight! We have an abundance of tomatoes from the garden that we used, but of course store bought or farmers market tomatoes are just fine too. And if you want to get crazy and make your own crust, it just makes this scrumptious meal that much better! Serve with a salad and you’re ready to go. 1.) Preheat oven to temperature on pizza crust package. 2.) Spread sauce on crust. If you like a lot of sauce, feel free to add as much or as little as you’d like. 4.) Next place tomato slices on top of crust, and add mozzarella slices on top of tomatoes. Sprinkle desired amount of minced garlic on very top. 5.) Cook in oven for about 8-10 mins (follow instructions on pizza crust). 6.) Remove pizza and drizzle a small amount of olive oil over the top if you so desire, and then sprinkle on basil. Salt and pepper if you’d like. Or for a little kick add red pepper flakes! 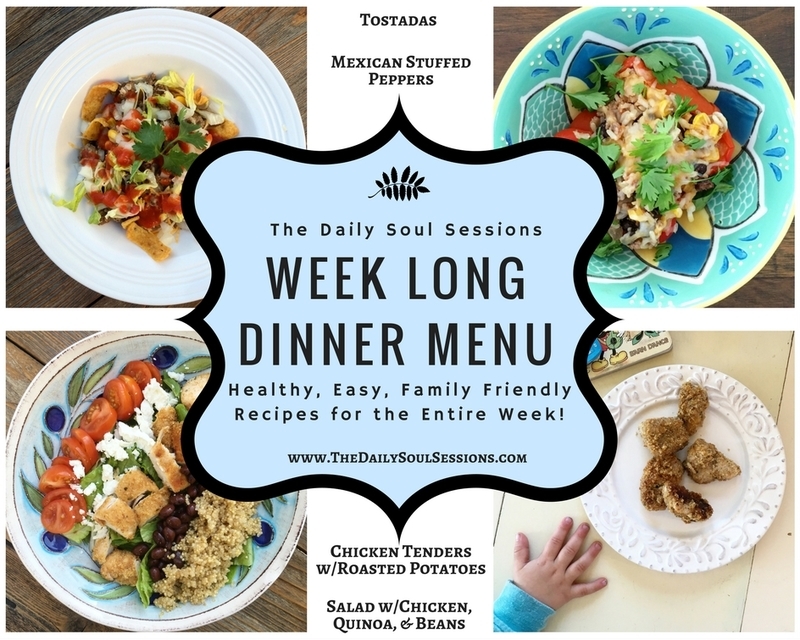 Get your FREE PDF of a Week Long Dinner Plan (including Grocery List & Recipes!) by signing up below! Get Your Meal Plan Now! We guarantee your privacy! Unsubscribe at any time. Welcome to your Second Trimester! Fireworks! Backflips! Cheers! All things you should do when you reach your second trimester. Well, maybe leave the backflips to your partner. Congratulations, Mama. All the horrors of the first trimester, including nausea, exhaustion, general ickiness should be subsiding. You are starting to feel more like your old self, just with an amazing miracle growing inside you! So read on for tips and tricks to remember during weeks 14-27 to make this pregnancy as comfortable and special as possible. If you’re still in your 1st trimester, check out tips to get you through HERE. And if you’re a lucky duck who is in her third trimester, click HERE. Want to know the 5 things I do Every Single Day to help get my mind right, my soul steady, and my creativity flowing? Check out my 5 Step Daily Pregnancy Routine – HERE! We all just need more magic and spirit in our life. It’s that simple, really. What inspires you? Causes you to dream? Keeps you faithful? Puts a smile on your face that starts deep down in your soul? Is it the ocean? An artist? A favorite book? Sometimes I get bogged down in the daily routine of my life, and I have to stop and remember what fuels my inner pilot light. If I get distracted from that, I feel it in a negative way. But honestly we should never feel “stuck” during this incredibly “unstuck” time in our lives. Never before have we experienced this much daily change. So go ignite that pilot light today…what are you waiting for? Can’t find the light? Start a morning journaling practice and/or MEDITATE! Download your free meditation worksheet and be diligent in practicing every day. Seek out other pregnant women. It’s a lovely and entertaining club you are now initiated into…if you let it be. Shrug off unwanted advice or chatter that doesn’t suit you, and focus instead on the friends who inspire you, the friends who make you laugh your way through this often times hysterical adventure. There is nothing better than a good belly massaging and soul smiling laugh. And if it makes you feel this good…imaging how the little nugget is feeling too. “A little bit of fear never hurt anyone…”. A classic saying. What are you afraid of today? Fear can motivate us, paralyze us, piss us off, or just exhaust us. What are you afraid of today? Stretch marks? The health of the sweet baby growing inside you? Perhaps it’s a fear of losing the life you led before. It could be a million different things, but for today, for right now, pick one. Pick one fear and dwell on it for just a few moments. Acknowledge this fear to yourself, your heart and soul, and watch what happens. Being grateful immediately releases your mind from a negative focus. Some days are harder than others to stay light. The hormones can so easily take over and take control, and to what purpose? When I feel the negative thoughts begin to win out, I immediately start mentally listing all the things I am grateful for. From the biggest love to the smallest lavender plant in my garden…I change my thoughts. And my focus shifts. Every time. Whatever was bothering me cannot survive in that happy place. So start that gratitude journal. Every night before you go to bed, write down one thing you are grateful for today. Just one. You’ll fall asleep with a smile on your face, I promise. Comparing ourselves to other pregnant mamas may be one of the worst symptoms we experience in these 9 months. And now is the time it can get really ugly. Our amazing tummies start to pop, and every single one of us pops differently. It is so hard to simply let go and just enjoy. Just enjoy the amazing organ that is our uterus and never, not once, ever compare ourselves to someone else. You and me…we are experiencing a miracle. Enjoy being a part of the miracle. Pregnancy is a complete rollercoaster. And one of the most challenging and thrilling times of your life. It is never too soon to start fully embracing all the changes you are going through – in fact, the sooner you start, the better you will feel! So please, mamas, enjoy this First Trimester Pregnancy Tips checklist! Not in your 1st trimester? Click HERE for 2nd trimester pregnancy tips and HERE for 3rd trimester tips. The definition of fatigue does not begin to describe the bone deep, foggy weariness that hangs around you these days. Nothing looks different to the outside world, but inside you are so so so tired. Did you know that in the early days of pregnancy you are exerting the same amount of energy as you would if you were in the gym body building all day? Every day. I had to pass this information along to my husband when he looked at me incredulously at my 7pm bedtime. This too shall pass, Mama…this too shall pass. So I have started to eat prunes. Yup. It was inevitable I guess, and I urge you, Mama, to start eating them daily. So eat up, buttercup. One of the most annoying side effects of pregnancy is constipation, especially if you have to up your iron intake. Start your regimen early…you won’t regret it! My tip? Throw them in a smoothie when they are hard to choke down – the sweetness makes it extra delicious. Glowing Green Smoothie with Prunes! Right now, today, before you lose any more control of your body, start taking care of it. Continue to exercise, stretch, and maintain your flexibility for as long as you and your doctor say you can. Physical activity fights fatigue, is healthy for your baby, and is vital to keeping you balanced. I know it’s hard to add that into an already exhausting day, but I promise we won’t regret it nine months from now. Take time for you. No one else will. My absolute favorite activity is Prenatal Yoga – not only is it amazing, but the community of mamas I’ve met there are friends for life! Believing in the unseen…isn’t that what faith is? Every so often, I have these moments where I’m dubious of this whole pregnancy thing. Am I really pregnant? Really!? How many pregnancy tests have you taken, new mama? If you’re like me, you took two. If you’re like my best friend, you took ten. Either way, your period has gone on an open-ended vacation, and it seems you are really and truly pregnant. Don’t worry; your first doctor appointment will bring proof that there is indeed a tiny miracle growing inside of you. But in the meantime, rely on your instinct, on your gut feeling that you are on your way to mamahood. And if all else fails, look at that pregnancy test again – you know you kept it! Kacey at 13 weeks! Dress is Target Maternity. Try this meditation on faith. Faith will get you through the early days of your pregnancy. The phrase blind faith didn’t originate out of thin air – faith is the belief in something that we have not yet seen. It’s a powerful thing, to be faithful. Close your eyes, and begin to breathe deeply. Ask yourself where your faith lives. In your heart? In the pit of your stomach? Maybe it’s in your fingertips. Wherever your faith lies, visualize a bright flame in that spot, illuminating the faith you have in yourself, in your new baby, and in the world you are creating for your family. As you breathe in, let the flame get brighter. As you breathe out, visualize that flame warming the world around you. Continue to breathe, and visualize this light until your heart feels settled. It is perfectly normal to feel like superwoman one moment – look what my body is doing! – and like the most fragile piece of glass the next – don’t hug me, don’t hug me! We are cyclical beings in the world. Our lives are not linear. Everything happens in cycles and seasons – passion, creativity, wisdom, success – they all ebb and flow. Right now your fertility is taking priority. Let it. Breathe in the morning sunshine, and accept the season your life is in today. Really embrace this stage you are in. The first trimester only lasts 13 short weeks, and then you’re on to the next phase! A great one, by the way, as most women report feeling much better in the 2nd trimester…hooray! What’s For Dinner? Your FREE Week Long Dinner Menu is HERE! What’s for dinner? The. Most. Aggravating. Question. Ever. And I get it every day. From my kid, from my husband, from my sisters who are just looking for inspiration! A simple enough question that requires too much planning and budgeting and time. My poor, tired, mama brain can hardly handle it. I’ve realized that if I don’t have a game plan mapped out before Monday night rolls around, we are doomed to blowing our budget (and healthy eating goals!) on fast food or take out. Well, fear not, my lovelies! We have crafted the perfect plan for you. Introducing our Week Long Dinner Menu! It’s a free PDF of 6 meals – all easy to make and extremely family friendly. This menu has literally saved my bum more times than I can count. 6 meal recipes – dinner for every night this week! Mmm mmm good! Now check your email to get your free meal plan! You seriously deserve this! It takes all the planning pressure off of your shoulders. Just print off the grocery list, hop in the car, scoop up your food, and start cooking. Let us know how it goes for you, and if you have any questions at all, please email us at contact@thedailysoulsessions.com! More week long menus to come – Happy Cooking!